School is back in session and here are some great books to celebrate your child’s new school year. All books are picture books and are perfect for ages three through seven. We Don’t Eat Our Classmates, by Ryan T. Higgins, is a wonderful and perfect story to help youngsters beginning school and learning to deal with others in a classroom setting. Penelope is an adorable little dinosaur who is surprised to find her new classroom full of humans! She must restrain herself from her desire to eat them in order to make friends and get along with others. This is a very ingenious and humorous way to help kids learn about their behavior and the consequences that can take place. The brilliant artwork was created by scans of tested clayboard for textures, graphite, ink and Photoshop. The lessons learned here will definitely make a positive teachable impact on youngsters! Be sure to check out the darling end-pages. 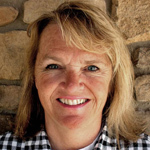 On the First Day of First Grade, by Tish Rabe, and brightly illustrated by Sarah Jennings, is a clever take on “The Twelve Days of Christmas” song. Each new day of school begins with a new activity and then repeating the activities already stated. What becomes clear is the first sentence throughout – “I had fun right away”. The illustrations were made by using Photoshop and watercolor paint to create the digital pictures and color fills each double-page entry. 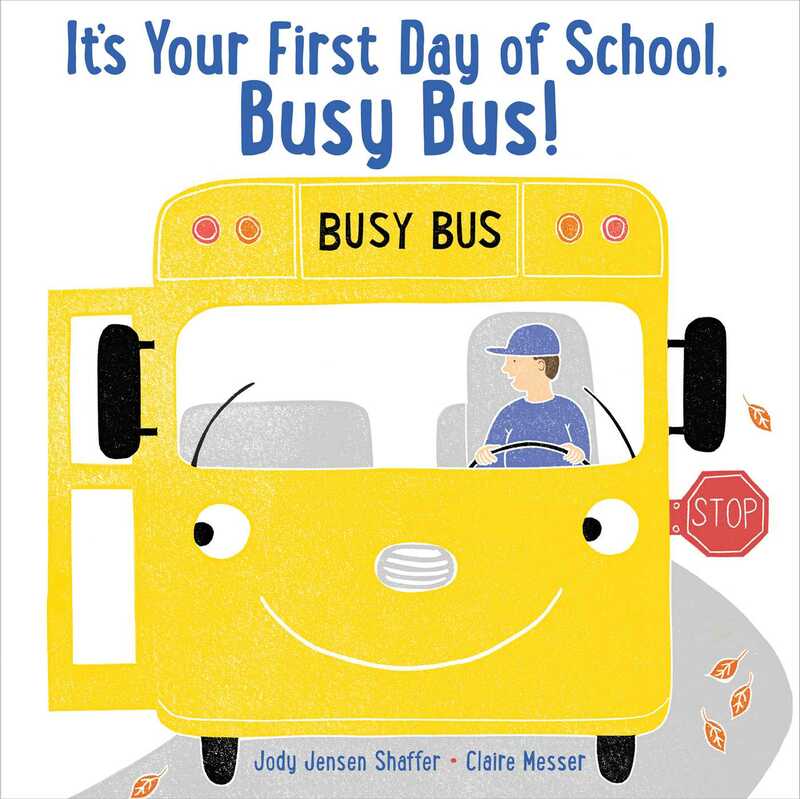 It’s Your First Day of School Busy Bus!, by Jodi Jensen Shaffer, and nicely painted with bright yellows found throughout by Claire Messer, will surely help those youngsters who are a bit nervous with beginning a new school year. This book takes the viewpoint of the bus and now he is jittery about being prepared. In the first part of the book, the driver makes sure the bus is safe by exploring the different parts of the vehicle. The rest of the book deals with the nervous bus greeting his passengers. The illustrations were made with lino prints and black ink and then colored digitally. Ready or Not, Woolbur Goes to School!, by Leslie Helakoski, and vividly painted with open-page scenes by Lee Harper, is a terrific story showcasing how the power of being confident and looking for the positive can help one get through new situations that may otherwise be frightening. Woolbur is about to start school and his parents worry he may not be ready. He states that he can dress himself and even write his name. 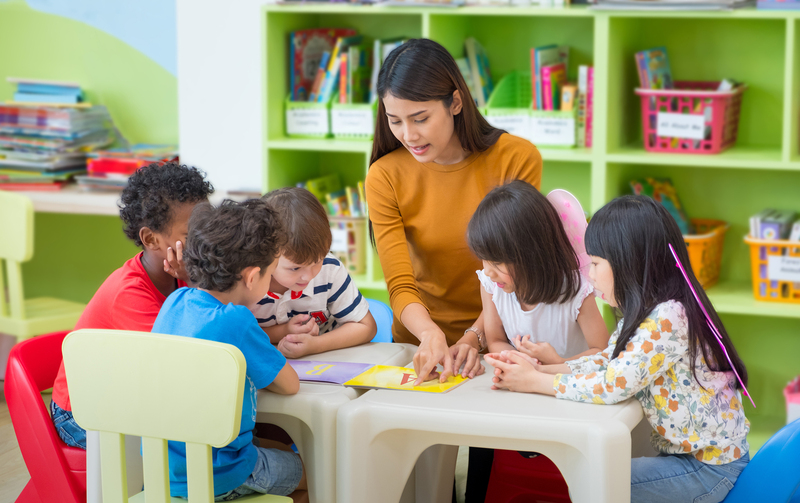 When others in the class complain that they have to wait to take their turn at activities, his reaction to his classmates is “I know” “Isn’t is great?” This is the same statement when his classmates complain. Woolbur is a wonderful example of enjoying all that comes our way! Click, Clack, Quack to School!, by Doreen Cronin, and painted with watercolor by Betsy Lewin, brings back the Click Clack Classic favorite with a new story about school. Farmer Brown tells his farm animals that he has been invited to school as a guest. But he warns his excited animal friends that they must be on their best behavior. They must be quiet and line up and be their very best. But something happens when they get to the school that will bring smiles to the animals and readers as well. Be sure you read the positive rules found at the end of the story. And the end-pages are a delight! Shark Dog and the School Trip Rescue!, by Ged Adamson, is a fun and funny story about this peculiar dog who is also part shark! Shark dog gets to go with the school class on a field trip to explore the great outdoors. But along the way, they come upon a hurt animal and they also lose their way. However, Shark Dog will come through for all problems at hand! The illustrations were made with pencil and watercolor. Dear Substitute, by Liz Garton Scanlon and Audrey Vernick, and painted with his trademark watercolor and gouache by the famous Chris Raschka, is a richly told story in the unique pattern of epistolary poems. When a student is not too happy with the fact that her teacher isn’t at school, she expresses her concerns in this poetic fashion. However, she begins to see how a little change can be a good thing after all. This book is so well painted and written, it could definitely become a Caldecott nominee! And please check out the clever end-pages. 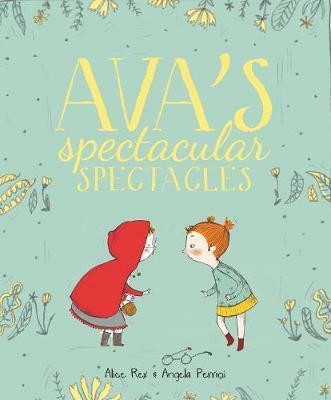 Ava’s Spectacular Spectacles, by Alice Rex, and illustrated with bright color filling the double-pages by Angela Perrini, begins with young Ava being asked where her glasses are by her teacher, Mrs. Cook. Ava doesn’t like to wear them, but Mrs. Cook is a very astute teacher and opens a large storybook in front of Ava. She proceeds to flip through the stories asking what would have happened if Little Red Riding Hood’s grandmother only had glasses! And Little Bo-Peep would never have lost her sheep if she had glasses on. And what about Little Miss Muffet? If she had her glasses on, she would have seen that spider and perhaps used bug spray! By the end of this book, Ava feels much better about her glasses!